Florg hungry... Florg like Petpets. You keep Petpets on plate, Florg eat them. Florg no like when Petpets fall on floor! Florg's favourite food is Hasee and Kadoatie... Florg think Slorgs are yuck. Florg is a giant mutant Chia who likes to eat petpets. 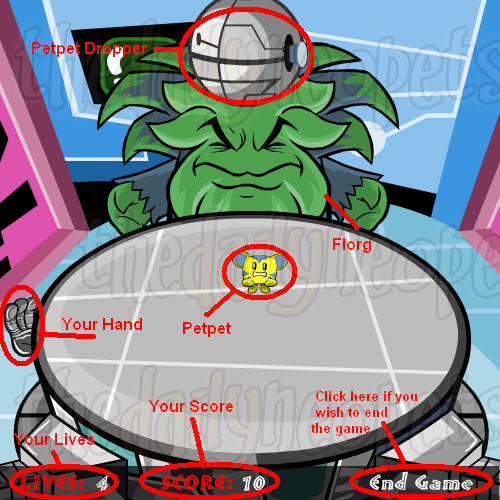 The point of this game is to feed Florg (as the name suggests) by keeping the petpets on the table. Sounds easy, right? Wrong! In the beginning, the game is simple, but as you go on, it gets harder, and if you are trying to get the avatar, good luck getting there! The controls for this game are simple. You have 2 choices, the keyboard or the mouse. Try each of them out first and see which one you like better. The keyboard is recommended because you have more control; the instructions are more deliberate and so there's no chance of the hand randomly going the other way or seemingly not listening to you. If you are using the mouse, keep it on or near the hand and move it around the table. If you are using the keyboard, the right arrow key will make the hand move around the table clockwise and the left arrow key will make the hand move around the table counter-clockwise. Choose whichever you're most comfortable with. The scoring for this game is pretty straight-forward. Every petpet is worth 10 points when Florg eats it. You also get 1 point every time a petpet hits your hand and stays on the table. Below is a screenshot of the game, which will help you get oriented if you are new. If you see two petpets both going towards the edge and you can only save one, save the slower one. It moves across the table slower giving you more time to react later. Make sure you get the petpets that are moving towards Florg; they can still fall off there. Just because they are heading towards him doesn't mean that he will eat them. Try to conserve your lives. In later levels there are more petpets on the table at a time, so it's more likely that you'll only be able to save one of them. At that point, you need all the extra chances you can get. If you're going for the avatar and you lose a life before having 50 points or above as your score, it is probably in your best interest to restart the game and try again. Unfortunately, Feed Florg involves a lot of luck. Sometimes two or more petpets stay on the table together and it's easy to save them both, and sometimes you have multiple petpets on the table and you can only save one. Just keep practicing and trying to get the avatar or trophy. With enough practice, you'll eventually get a lucky game!